Vintage - Lefton Fine China, Hand Painted, Golden "Wheat" Pattern #20183, 21-Pieces, Service for (8) Eight, Circa 1958. An Exquisite Coffee / Snack Set service for (8) Eight, by the Lefton China Co. in the Golden "Wheat" Pattern fro 1958. This is a Scalloped White China with a Pattern of Golden Wheat Blowing in the Wind. An Abundance of 22kt Gold Trim on every Piece. Consists of a 1-Coffee Pot w/Lid, 8-Snack Plates with inset ring for Cups, 8-Cups, 1-Sugar Bowl w/Lid, and 1-Creamer. Could also be used as a Casual Tea Set, or for Sandwich & Chips or Salad, and a drink of Punch or maybe lemonade... In very good condition. 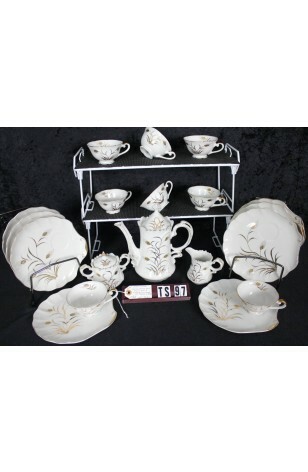 An Exquisite Coffee / Snack Set service for (8) Eight, by the Lefton China Co. in the Golden "Wheat" Pattern fro 1958. This is a Scalloped White China with a Pattern of Golden Wheat Blowing in the Wind. An Abundance of 22kt Gold Trim on every Piece. Consists of a 1-Coffee Pot w/Lid, 8-Snack Plates with inset ring for Cups, 8-Cups, 1-Sugar Bowl w/Lid, and 1-Creamer. Could also be used as a Casual Tea Set, or for Sandwich & Chips or Salad, and a drink of Punch or maybe lemonade... In very Good Resale Condition unless noted below or in pictures.